In large saucepan, heat soup, milk and 4 oz cheese over low heat. 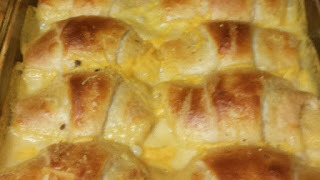 Place chicken on large end of each roll and top with a little cheese. Roll up and place in sprayed 9x13 baking dish. Pour 1/2 soup mixture directly into dish (not on top of crescent rolls). Bake for 10 to 15 minutes, until rolls rise slightly and lightly brown. Pour remaining soup mixture into dish. Sprinkle with remaining cheese. Return to oven a few minutes, until cheese has melted.